Wahoo! Time for the holidays… er… I mean next month, time for the holidays! My favorite time of year is the holidays. Why? All the food of course =)! That’s why I’m getting way ahead of myself. I can’t help it though, I saw these little candy pumpkins at the store the other day and thought, Oh I’ve just got to bake something with these. I bought a big bag then hid some up in the cupboard but somehow my family managed to sniff them out. I guess the baking cupboard is a given, everyone knows I’ve got a huge stash of goodies up there =). 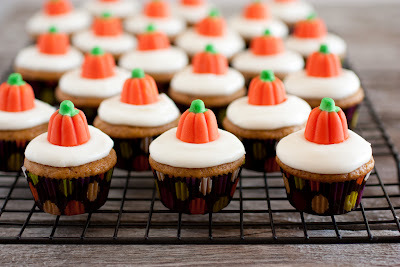 Luckily there were just enough left to make the perfect cupcake toppers for these delicious, bite size, Mini Pumpkin Cupcakes. 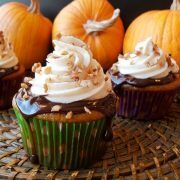 For this recipe, I basically combined my Pumpkin Bars recipe with the cupcake portion of my Pumpkin Cupcakes with Chocolate Ganache and Spiced Cream Cheese Frosting (one of my favorite cupcakes). These cute mini cupcakes pack a lot of sweetness, moisture, flavor and pumpkin-y goodness into one little bite. 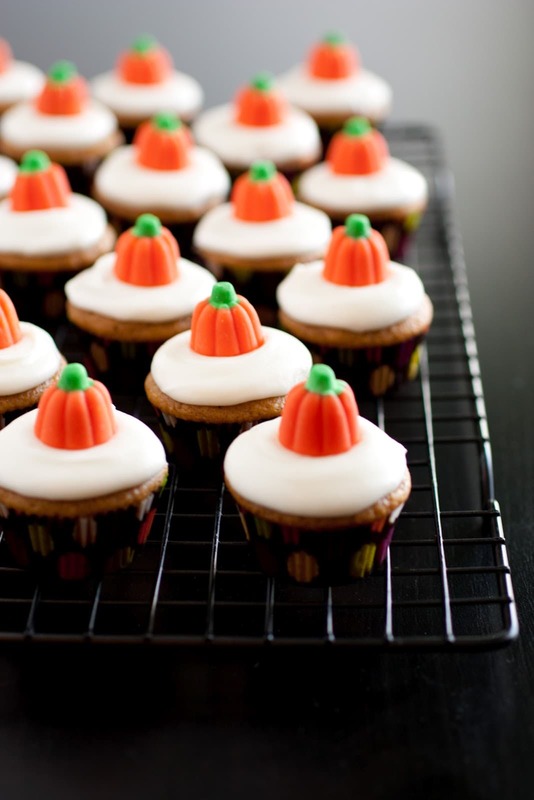 They would be perfect for a Halloween party or for Thanksgiving of course. 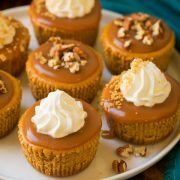 You can’t have Thanksgiving without some kind of pumpkin dessert, right? Or you can make them and eat them for breakfast like my kids did, when they aren’t frosted they are basically a fluffy pumpkin muffin so I figured why not =). Enjoy and share, because these are the perfect sharing size! Fun deliciously flavor mini cupcakes that are perfect for the fall season! Preheat oven to 350 degrees. In a mixing bowl, whisk together flour, baking powder, baking soda, salt, cinnamon, nutmeg and ginger, set aside. In a separate large mixing bowl, using and electric hand mixer on low speed, blend together light-brown sugar, granulated sugar, butter and applesauce until well combine and smooth, about 1 minute. Mix in egg, egg yolk and vanilla. Add pumpkin puree and buttermilk and mix until well blended. Slowly add dry ingredients and mix just until combine. 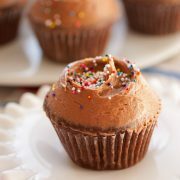 Fill paper lined mini muffin cups 2/3 full (about 1 slightly heaping Tbsp in each) and bake in preheated oven 12 - 14 minutes until toothpick inserted into the center of cupcake comes out clean. Allow to cool completely then frost with Cream Cheese Frosting and optionally top each cupcake with a pumpkin candy. Store in an airtight container. 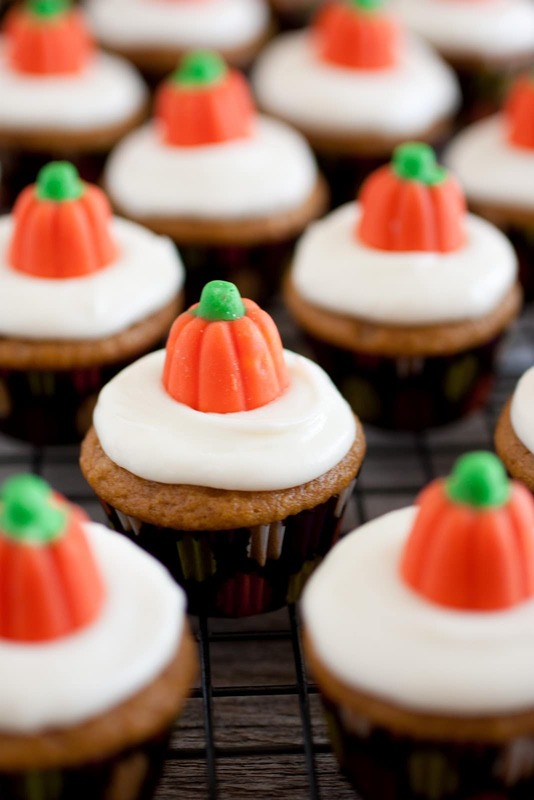 Note: I would recommend serving these within an hour or two of topping them if you are adding the pumpkin candy because after that the frosting will begin to break the candy down. I would also recommend storing them in the refrigerator (if not enjoying within a few hours) in an airtight container and then let them rest at room temperature before serving. Combine cream cheese and butter in a mixing bowl and using an electric hand mixer on medium speed, blend together until light and fluffy. Add in powdered sugar and vanilla and blend on low speed until combine, then increase to medium and whip until smooth and fluffy. « Campfire Tarts and My First Giveaway!